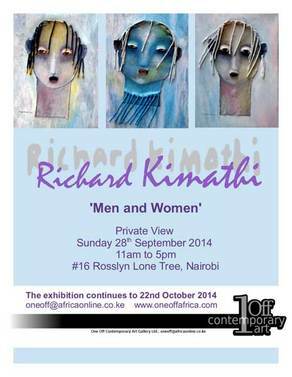 In Kenya, Richard Kimathi needs little introduction; very much an 'artists artist' he is revered by most of the practicing artists in the region. On the international stage Kimathi has also achieved considerable success. February of this year saw Kimathi exhibiting in the first group exhibition of East African artists at the Gallery of African Art at number 9, Cork Street, London. Kimathi's oil painting, 'Strangers', was the first piece from the exhibition to sell. 'A fresh perspective', 'constantly pushing the envelope', 'innovative', 'inventive' are all words used to express Richard Kimathi's latest works and these expressions of admiration are repeated over and over as each new series emerges from his studio. Ex - Royal College of Art Lecturer, Mandy Bonnell calls his painting skill 'sublime'. His latest exhibition, titled 'Men and Women', is no exception. In this series, Kimathi is furthering his exploration of expression and what elements in facial features create that expression. He takes the kerosene lamp wicks from his 'Colourful Rain series' and uses them as hair, he gives his huge eyes three dimensional lids and he pastes lips over his people's teeth. Next he lines up the exact same cut outs of men and experiments with minor alterations to their clothing to see what effect he can achieve. The two biggest paintings in the show revert to his favourite theme of human relationships. In 'Olive Branches', Kimathi is looking at gay relationships, and in 'On and On', he explores the predicament of a woman in numerous simultaneous heterosexual relationships. The male figures change whilst she remains expressionless, unmoved, her face a mask. His constant investigation is fascinating and well worth a gallery visit to ponder for yourself.